This past spring, the National Research Council of the National Academies released its report, Discipline-Based Education Research: Understanding and Improving Learning in Undergraduate Science and Engineering . The charge to the committee writing this report was to synthesize existing research on teaching and learning in the sciences, to report on the effect of this research, and to identify future directions for this research. The project has its roots in two 2008 workshops on promising practices in undergraduate science, technology, engineering, and mathematics education. 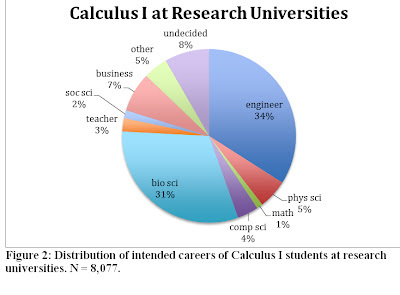 Unfortunately, between 2008 and 2012 undergraduate mathematics education dropped out of the picture. 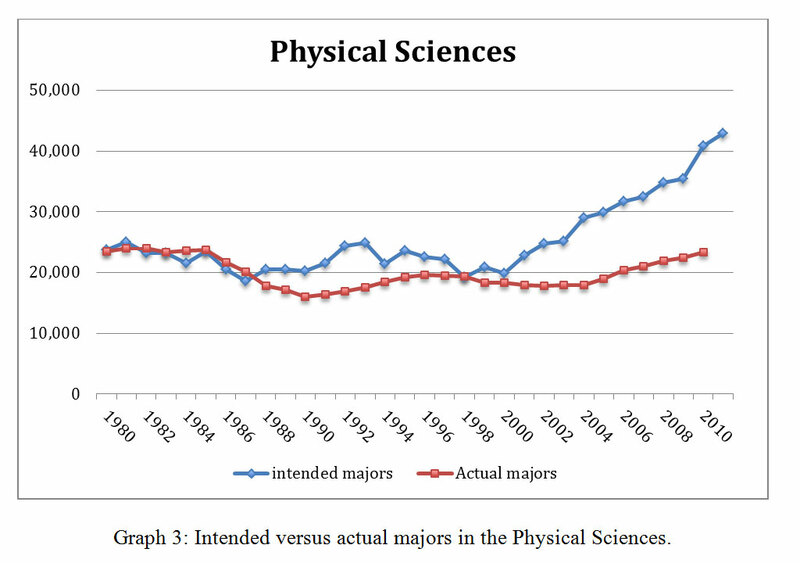 The resulting report discusses undergraduate education research only for physics, chemistry, engineering, biology, the geosciences, and astronomy. Nevertheless, it is an interesting report with useful information—especially the instructional strategies that have been shown to be effective—that is relevant for those of us who teach undergraduate mathematics. 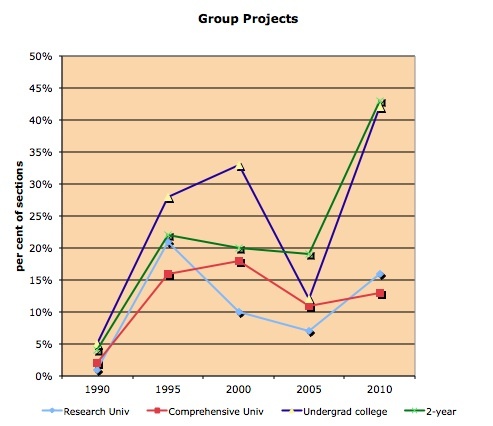 The studies that are described are founded on the assumption that students must build their own understanding of the discipline by applying its methods and principles, and this is best accomplished within a student-centered approach that puts less emphasis on simple transmission of factual information and more on student engagement with conceptual understanding, including active learning in the classroom. The great strength of this report is the wealth of resources that it references and the common themes that emerge across all of the scientific disciplines. A lot of attention is paid to the power of interactive lectures. Given that most science and mathematics instruction is still given in traditional lecture settings, finding ways of engaging students and getting them to think about the mathematics while they are in class is essential for increasing student understanding. The recommendations of effective practice range from simple techniques, such as starting each class with a challenging question for students to keep in mind, to transformative practices such as collaborative learning. A common intermediate practice involves student engagement by posing a challenging question, having students interact with their peers to think through the answer, and then testing the answer. In some respects, this is more easily done in the sciences where student predictions can be verified or falsified experimentally. Yet it is also a very effective tool in mathematics education where a well-chosen example can falsify an invalid expectation and careful analysis can support correct understanding. But most important is that it forces to try to use what they have been learning. In large classes, this type of peer instruction can be facilitated by the use of clickers. The report does include the caveat, with supporting research, that merely using clickers without attention to how they are used is of no measurable benefit. The greatest learning gains that have been documented occur when collaborative research is incorporated into the classroom. The NRC report includes many descriptions of how this can be accomplished in a variety of scientific disciplines. It also references the research that has established its effectiveness. Again, attention to how it is done is an important component of effective practice. Two of the areas that are identified as needing more research are issues of transference (see my September column on Teaching and Learning for Transference) and metacognition. Usefully, the authors point out that there are two sides to transference: the ability to draw on prior knowledge and the ability to carry what is currently being learned to future situations. Metacognition is an important issue in research in undergraduate mathematics education, especially for those studying the difference between experts and novices engaged in activities such as constructing proofs. Experts monitor their assumptions and progress and are prepared to change track when a particular approach is not fruitful. Novices are more likely to choose what to them seems the likeliest approach and then ignore alternatives. In sum, this is a useful and thought-provoking report. 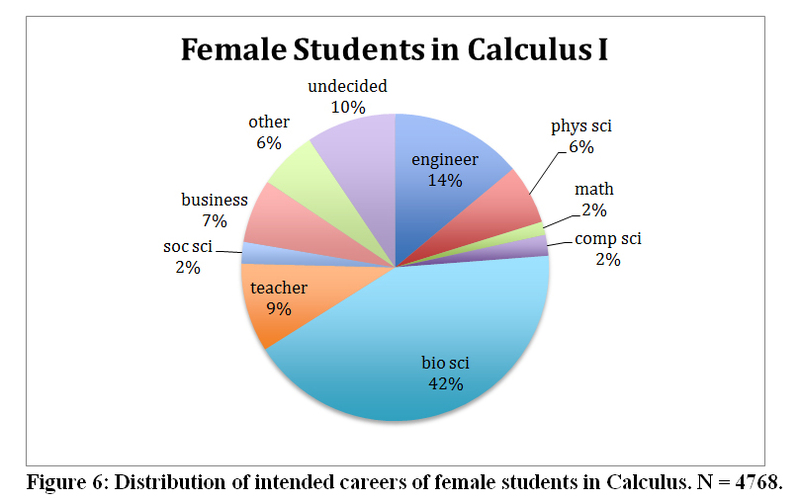 I wish that it had included undergraduate mathematics education research, but perhaps that omission can be corrected as we move forward. National Research Council. 2012. 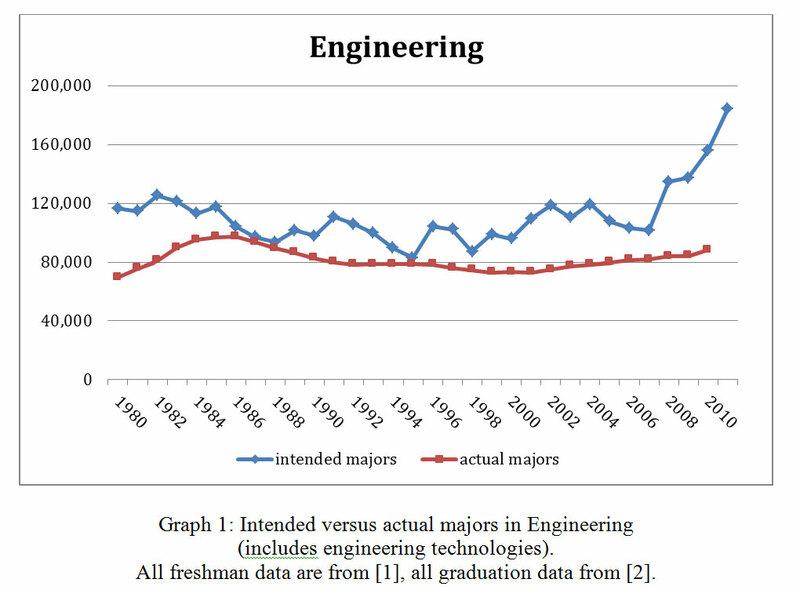 Discipline-Based Education Research: Understanding and ImprovingLearning in Undergraduate Science and Engineering. S.R. Singer, N.R. Nielsen, and H.A. Schweingruber, eds. Washington, DC. The National Academies Press. One of the goals of the MAA Calculus Study, Characteristics of Successful Programs in College Calculus, was to gather information about the instructors of mainstream Calculus I. 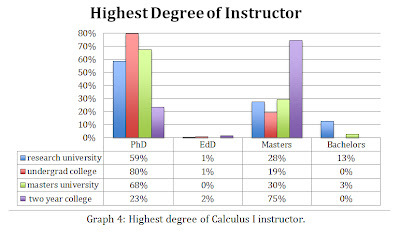 Here, stratified by type of institution, is some of what we have learned, refining some of the data presented in “The Calculus I Instructor” (Launchings, June 2011). 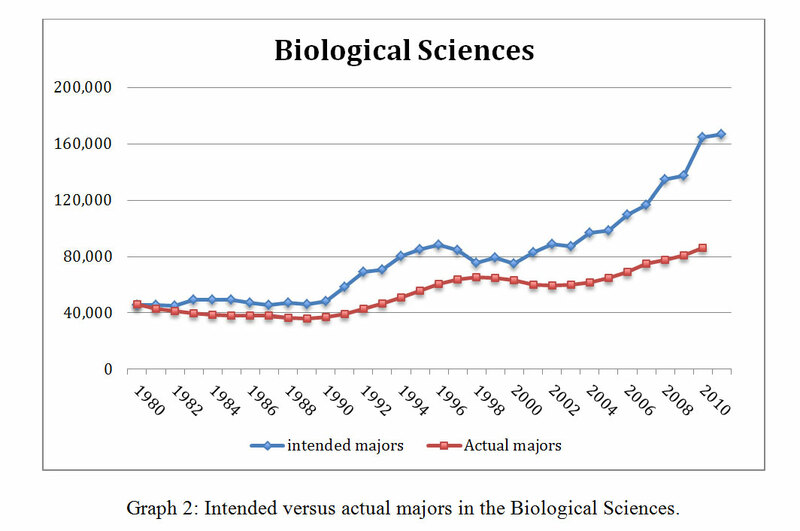 Again, I am using Research University as code for institutions for which the highest mathematics degree that is offered is the PhD, Masters University if the highest degree is a Master’s, Undergraduate College if it is a Bachelor’s, and Two Year College if it is an Associate’s degree. These surveys were completed by 360 instructors at research universities, 73 at masters universities, 118 at undergraduate colleges, and 112 at two year colleges. Calculus I instructors are predominantly white and male. 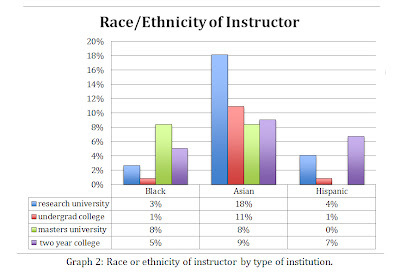 Masters universities have the largest percentage of Black instructors, research universities of Asian instructors, and two-year colleges of Hispanic instructors. 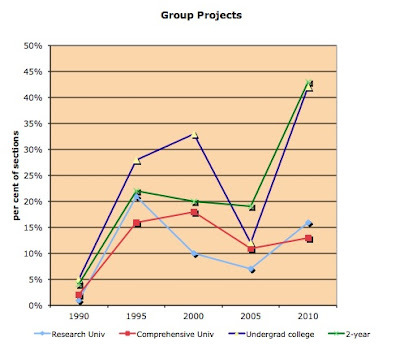 By and large, undergraduate colleges do not do well in representing any of these groups. 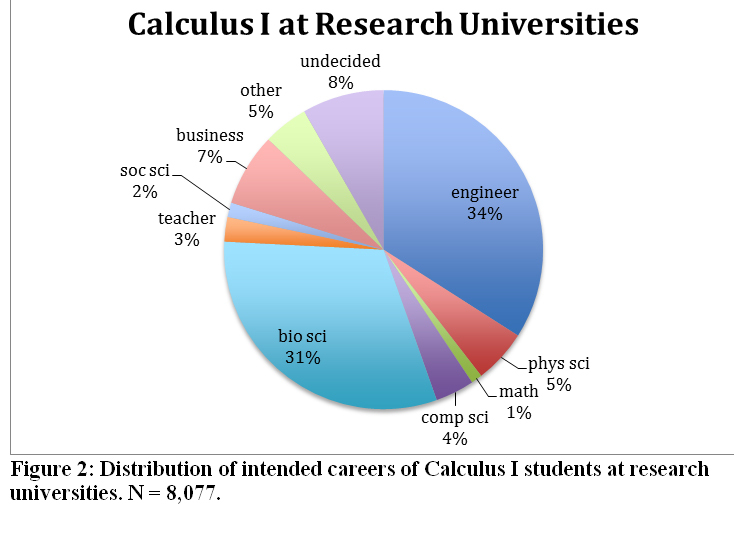 There is a dramatic difference between the status and highest degree of Calculus I instructors at research universities and those at other types of colleges and universities. 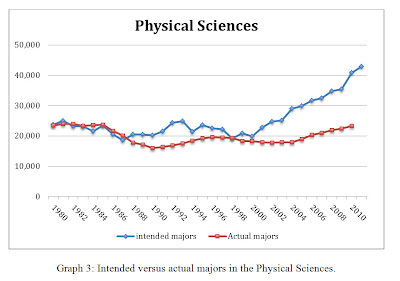 At research universities, instructors are less likely to be tenured or on tenure track, or to hold a PhD. 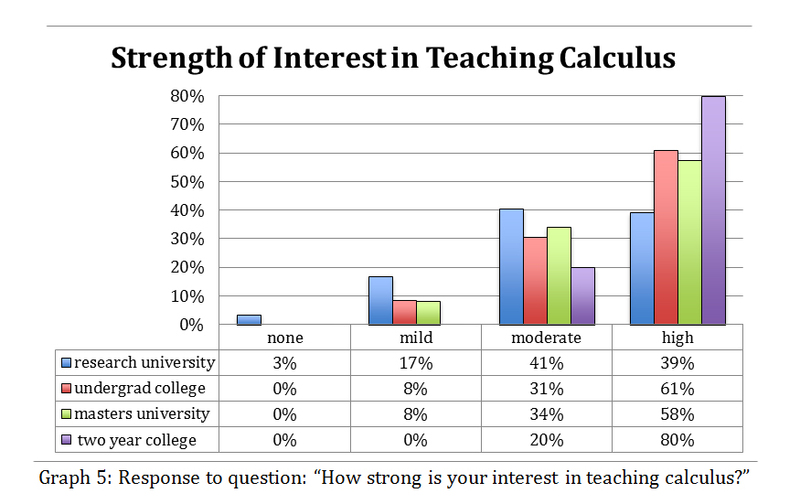 They are also less likely to want to teach calculus: One in five has no interest or only a mild interest in teaching calculus. 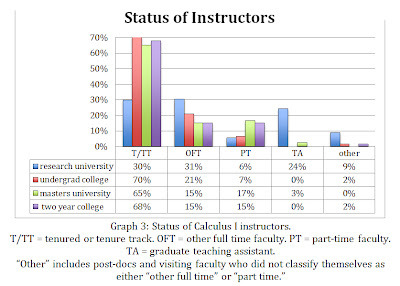 The high number of part-time faculty at masters universities and two year colleges is troubling because of the evidence that such instructors tend to be less effective in the classroom and much less accessible to their students . 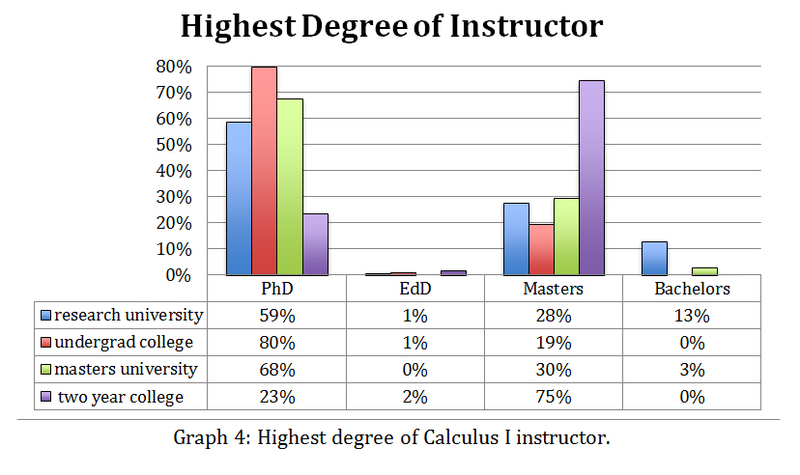 Not surprisingly, less than a quarter of the Calculus I instructors at two-year colleges hold a PhD. Generally, calculus instructors consider themselves to be somewhat traditional in their instructional approaches, and they believe that students learn best from lectures. 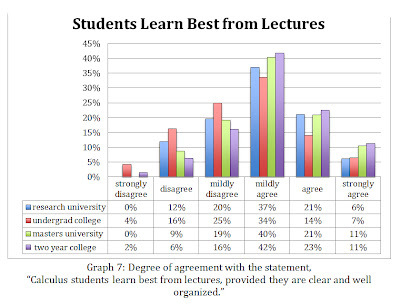 The greatest divergence from these views is at undergraduate colleges where almost half consider themselves to be innovative and 45% disagree that lectures are the best way to teach. 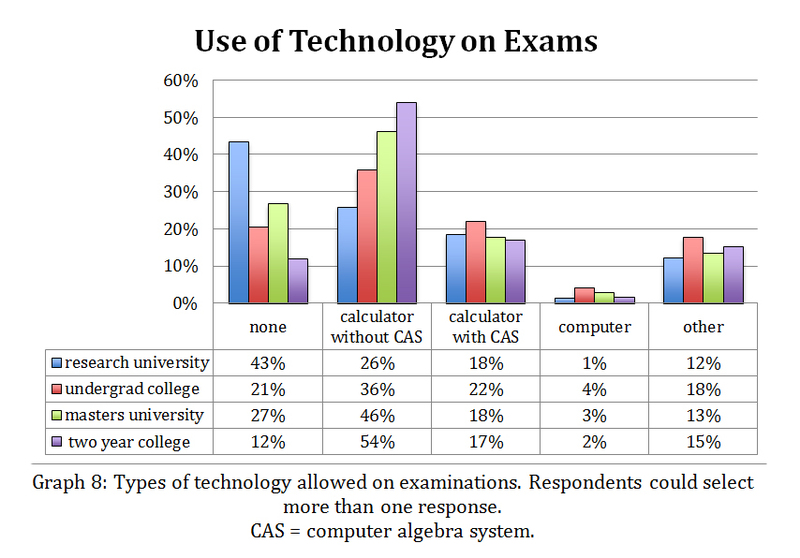 The greatest variation among faculty at different types of institutions is over the use of calculators on exams. 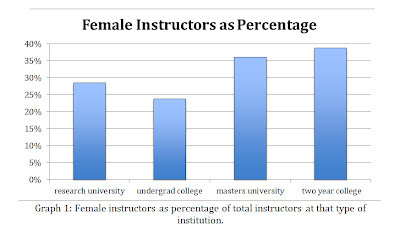 Close to half of the instructors at research universities do not allow them; 71% of the instructors at two year colleges do. 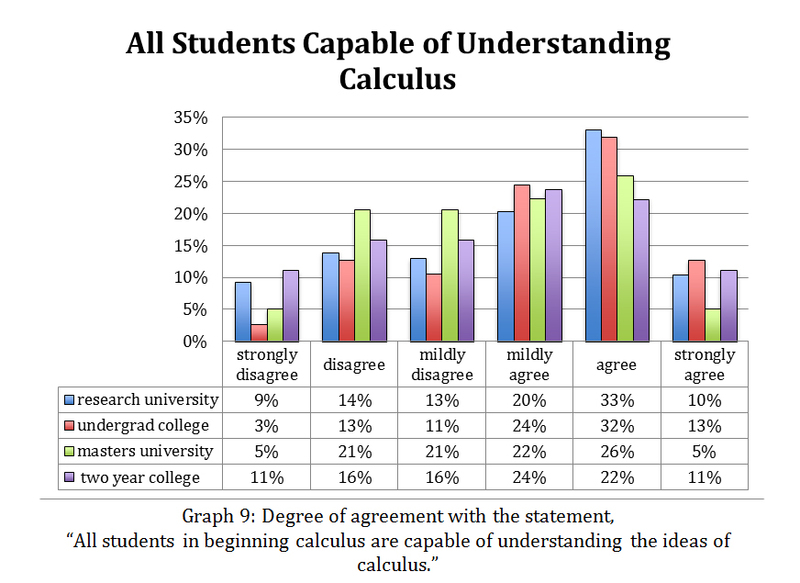 There also are institutional differences in beliefs about whether all of the students who enter Calculus I are capable of learning this material. 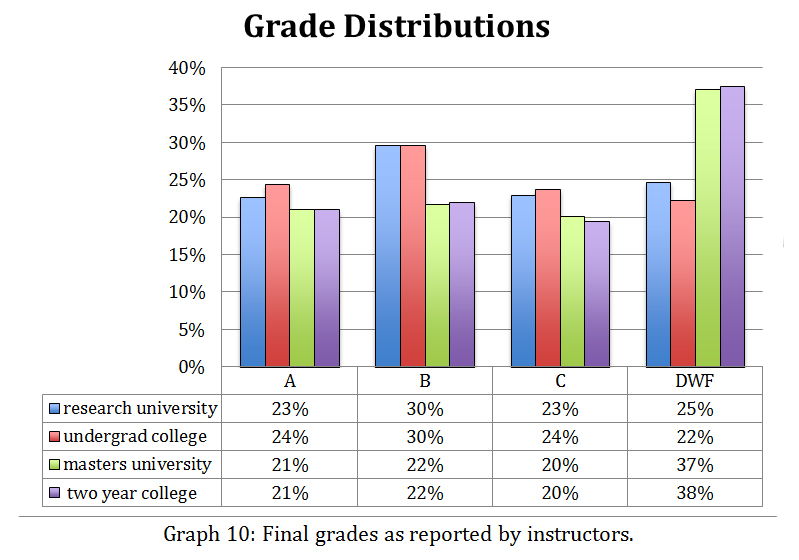 Finally, we look at the grade distributions by type of institution. Schmidt, P. Conditions Imposed on Part-Time Adjuncts Threaten Quality ofTeaching, Researchers Say. Chronicle of Higher Education. Nov 30, 2010. 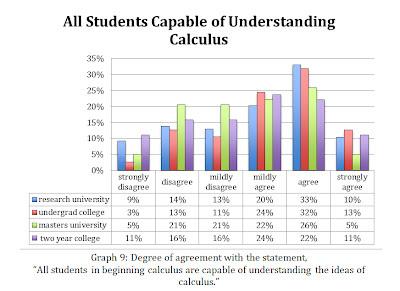 This is the first of what I intend to be a series of reports that delve into the data on Calculus I instruction that were collected in fall 2010 as part of MAA’s study Characteristics of Successful Programs in College Calculus (NSF #0910240). Some of the raw summative data was reported in earlier Launchings columns [1,2], but we have now separated the data by type of institution, characterized by highest degree offered in mathematics. 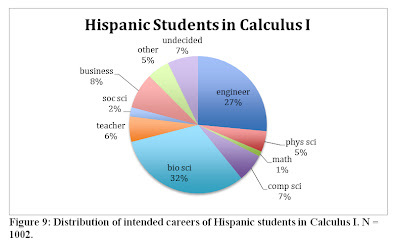 Combined with knowledge of the number of students who took Calculus I in fall 2010 at each of the types of institutions—thanks to the Conference Board of the Mathematical Sciences (CBMS) 2010 survey—it is now possible to appropriately weight the data that has been collected. A preprint of an article that summarizes the methods and instruments used for the surveys with selected results  has been posted on the website maa.org/cspcc. 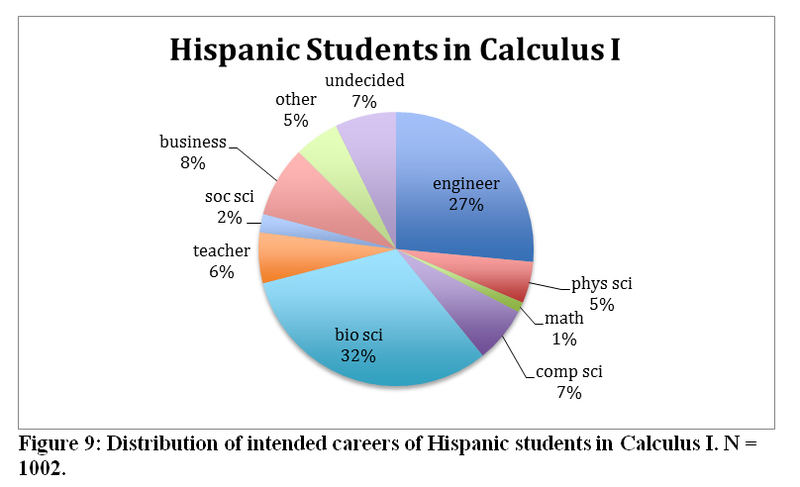 For this month, I want to focus on the intended careers of students as they begin mainstream Calculus I. This is a course that took on its modern form after the Second World War, and in most places it still follows the curriculum as laid out in George Thomas’s Calculus and Analytic Geometry of 1951 . The course was designed to meet the needs of engineers and those in the physical sciences. However, as illustrated in Figure 1, just under 35% of those taking Calculus I today are on one of these tracks. 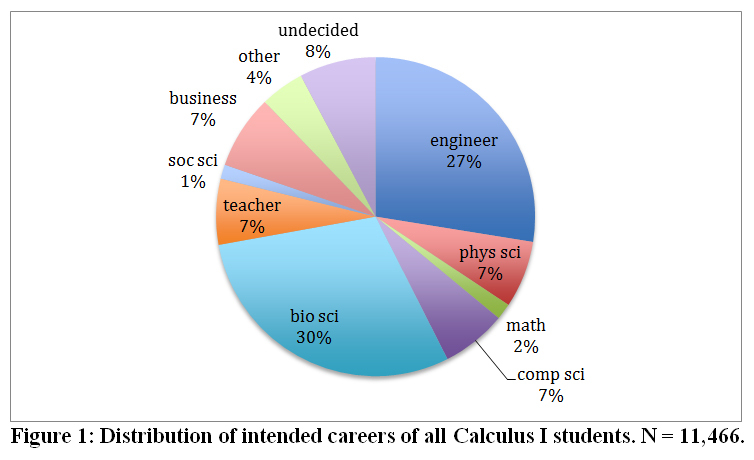 Today’s Calculus I student is more likely to be pursuing a career in the biological or life sciences than in engineering. 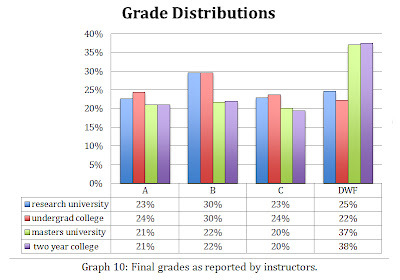 These percentages were calculated by determining the percentages for each of the four types of postsecondary institutions as classified by CBMS. We refer to universities that offer a doctorate in mathematics as research universities, those for which the highest degree in mathematics is the master’s as masters universities. If bachelor’s is the highest degree we call it an undergraduate college, and if associate’s is the highest degree we call it a two-year college. 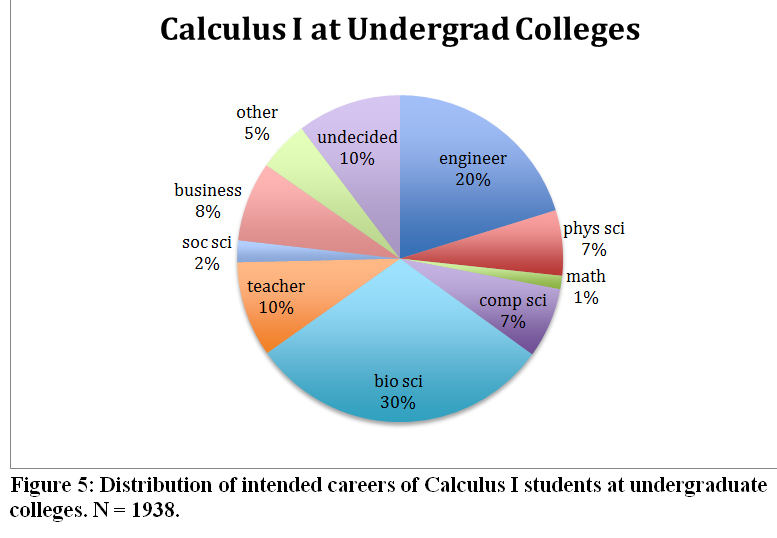 The distributions were then weighted according to the number of students who were enrolled in Calculus I that fall: 110,000 at research universities, 41,000 at masters universities, 82,000 at undergraduate colleges, and 65,000 at two-year colleges. It is interesting to look at the data by type of institution. 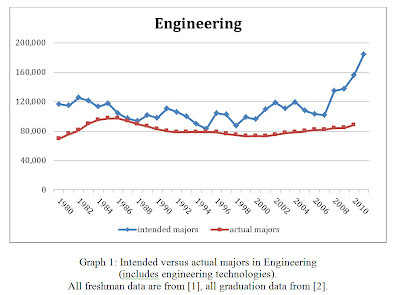 Only at research universities and two-year colleges do those heading into engineering outnumber those with an intended major in the biological or life sciences. 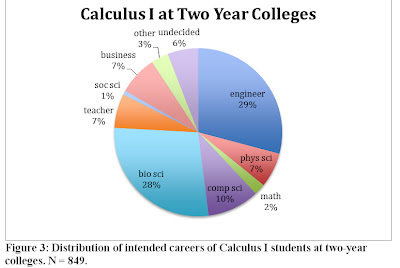 Even there, the majors that normally require a full year of single variable calculus account for less than half of the Calculus I students. See Figures 2 and 3. 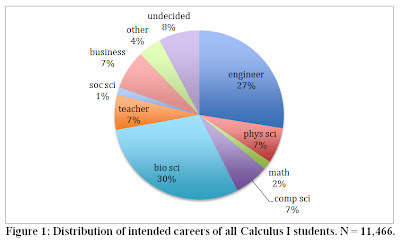 These are also the only types of institution where students going into science, technology, engineering, or mathematics (STEM) fields constitute over 75% of all Calculus I students. 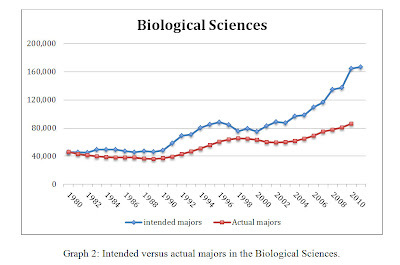 The biological sciences are much more dominant, and students are significantly less likely to be intending a STEM major, at masters universities and undergraduate colleges. See Figures 4 and 5. The following graphs show the distribution of intended careers for women, Asian-American students, Black students, and Hispanic students. See Figures 6–9. The variation in distributions is most dramatic for women. 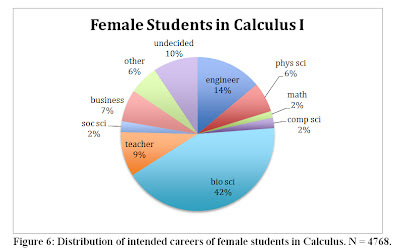 A women in Calculus I is three times as likely to be headed into the biological sciences as into engineering. 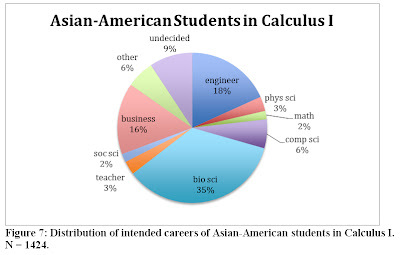 It may come as a surprise to some that Asian-American students in Calculus I are almost twice as likely to be majoring in the biological or life sciences as engineering, but this follows a general trend of Asian-American students out of engineering and into biology. 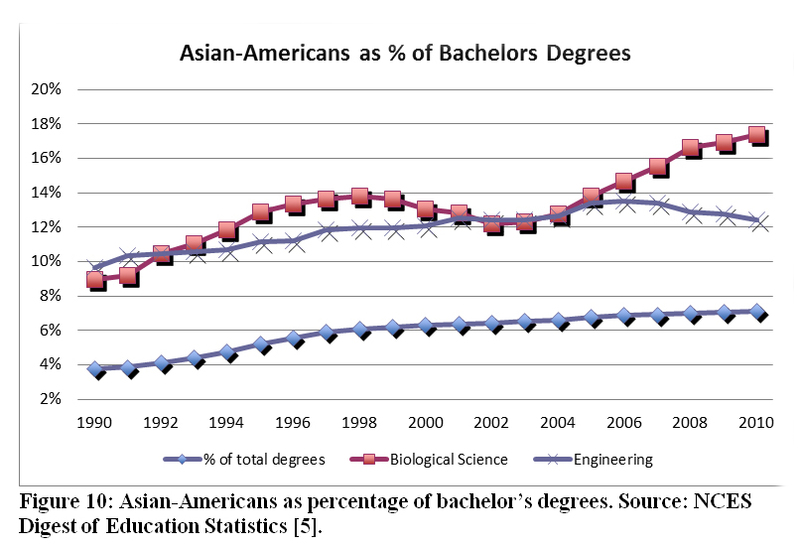 While Asian-Americans are still very well represented in engineering, making up over 12% of the bachelor’s degrees in engineering while they are only 7% of all bachelor’s degrees earned in the United States, Asian-Americans constitute almost 18% of the bachelor’s degrees in the biological sciences. See Figure 10. 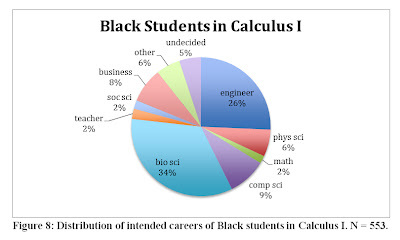 Of course, these data are skewed by the fact that many students, especially many of those going into engineering or the physical or the mathematical sciences, never take Calculus I in college. 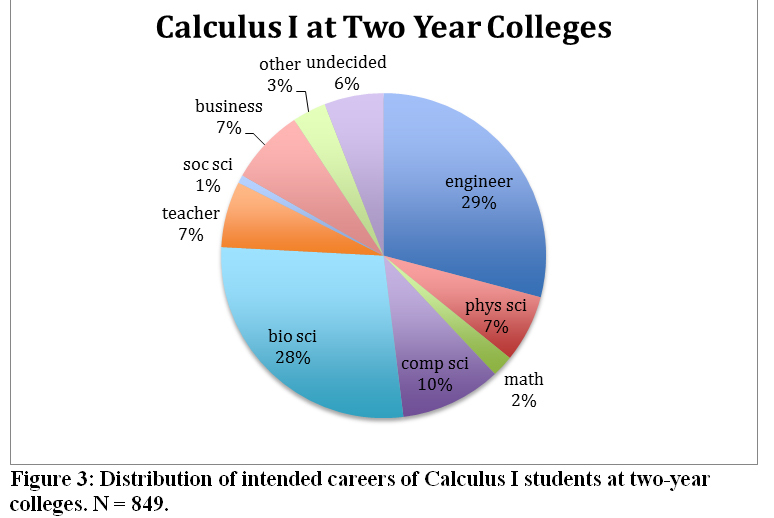 They begin their college mathematics at the level of Calculus II or higher. Unfortunately, there are no good estimates for the size of this population. But that still leaves the question that we have addressed at Macalester: Why teach Calculus I as if it is the first half of a year-long course when—for most of the students who take it—the next calculus course is not required or even expected? Bressoud, D.M. 2011. The Calculus I Student. Launchings. 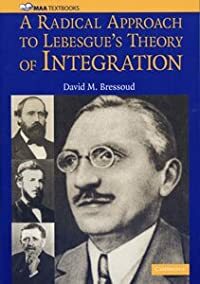 Bressoud, D.M. 2011. The Calculus I Instructor. Launchings. D. Bressoud, M. Carlson, V. Mesa, C. Rasmussen. 2012. 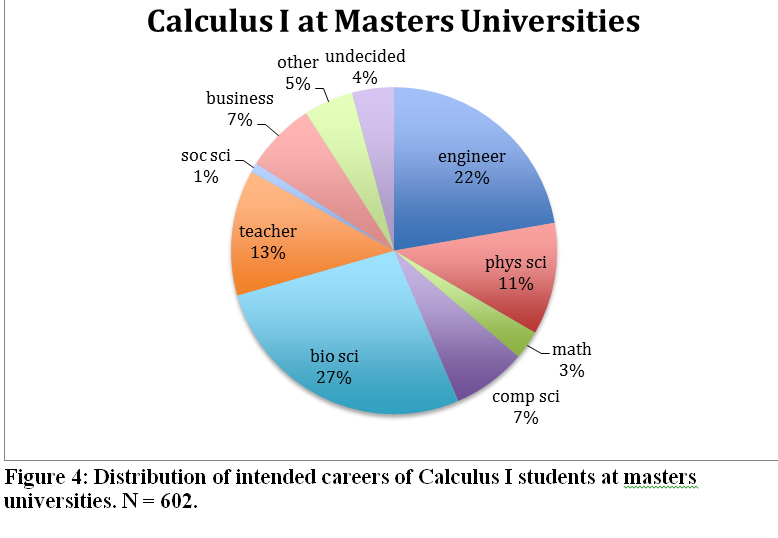 Description of and Selected Results from the MAA National Study of Calculus (pdf). Submitted to International Journal of Mathematical Education in Science and Technology. G.B. Thomas. 1951. Calculus and Analytic Geometry. Addison-Wesley. Reading, MA. National Center for Education Statistics (NCES). 2011. 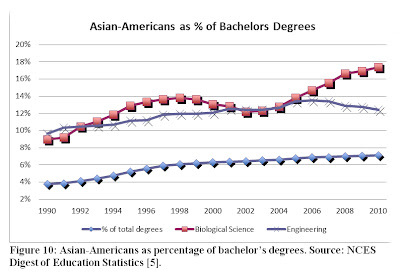 Digest of Education Statistics. US Department of Education. Washington, DC. The March 30 issue of Science included a letter from psychologists David Daniel and Daniel Willingham  that provides an excellent overview of what is known about how students use online textbooks, including an account of what we know about the strengths and the weaknesses of switching from print to electronic delivery. I find that what they have to say is in line with my own experiences. For the past year, I have taught our Single Variable Calculus class using MAA’s online textbook Calculus: Modeling and Application, 2nd edition, by David Smith and Lang Moore. This is a direct descendant of their Project CALC materials that I have used and loved. The current edition is only available as an online textbook. The overwhelming advantage of online publishing is the cost savings. The cost to my students is $25 apiece. This is charged as a lab fee. 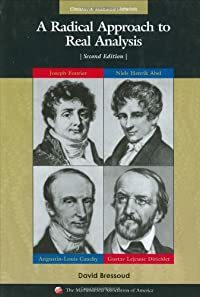 In exchange, my students get to download the entire textbook onto their own computers, a benefit that is relatively uncommon among online mathematics texts but which my students appreciate because they are not restricted to using their textbook only when they have internet access. Smith and Moore’s book is written in html, using MathML for the mathematics (which effectively restricts the web browser in which it is read to FireFox). The authors have done a thoughtful job of separating the chapters into sections that each fit fairly comfortably on a single web page. Several of my students have commented on how much that helps with the readability of the text. But my students have found that reading an online textbook does require a period of adjustment. I have yet to encounter a student who prefers reading web pages instead of printed pages. Daniel and Willingham cite three different studies that confirm that most students prefer traditional print books. Intriguingly, online texts work very well for young readers. In fact, those learning how to read often do better with online books. The difficulties seem to arise when students need to study and learn from the text, a characteristic that is especially true of mathematics books. For reasons that we do not fully understand but which are well documented, careful reading of an electronic text takes longer and is more fatiguing than trying to learn the same material from a printed text. The research also has found that this effect of greater difficulty with electronic texts is independent of the level of familiarity and experience with e-books. One of the greatest benefits of online textbooks is the ability to embed links to definitions, animations, and software programs. 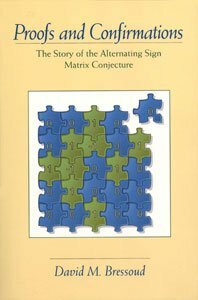 Smith and Moore’s textbook is liberally sprinkled with links to explorations that are available in Maple, Mathcad, and Mathematica. There also are links to WeBWorK, where a library of problems linked to the sections of their book is available. My own experience is that students frequently ignore the links to explorations unless I specifically assign them. This is in line with the findings reported by Daniel and Willingham: Students often find such ancillary material distracting at best, confusing at worst. Following these links often leads to loosing the thread of the conceptual development in the text. Another characteristic of e-textbooks that can cut both ways is the ability to link to networking sites where they can exchange thoughts about the mathematics and insights into each other’s difficulties. While that can be very beneficial, there is also the danger that these students will be tempted by the distraction of social media that is equally close at hand. As Daniel and Willingham point out, online textbooks are easily corrected and updated. For the authors of such a text, that means that the job of working on the book is an ongoing task that is never completed, working against the ability to keep the cost down. The bottom line is that we do not yet know how best to take advantage of online textbooks. Doing it right is clearly not as simple as putting the text on line and inserting links. David B. Daniel and Daniel T. Willingham. 2012. 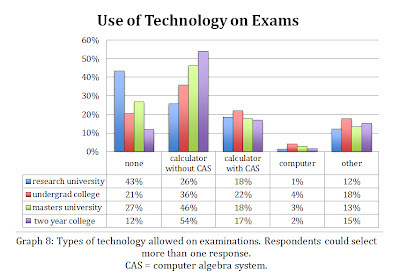 Electronic Textbooks: Why the Rush? Science. 335. 30 March, 2012. 1570–71.